You probably have seen a car, typically a classic, with some gold leafing. You know the look! It is a muddled gold look that still radiates and sparkles. Sometimes painters will use silver leaf for the same look. 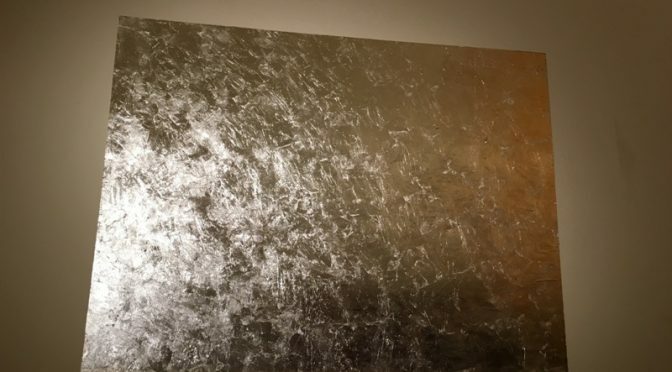 Well New York artist Dove Bradshaw has come up with a new way to use silver leaf as an art medium. She put silver leaf on a museum wall and has let it stay exposed to the elements. So over time and exposure to the elements, it should change it’s appearance. Now we’ll leave it to our readers to say whether it is art or not. But if you can put it on a car, why not a museum wall? You can check out the artwork information from the Phillips Collection here. Previous PostArizona Concours d’Elegance – More Classic WinnersNext PostClassic Car- Drive it or Store it?